The South Shore of Massachusetts is a geographic region stretching south and east from Boston along the coast of Cape Cod Bay toward Cape Cod. Braintree - A city on the I-95 beltway with a large mall. Bridgewater - Home of Bridgewater State College. Brockton - The "City of Champions" largely because of its boxing native sons. Carver - A fast-growing residential town in cranberry country. Cohasset - Home of South Shore Music Circus. Duxbury - A year round seaside community. Hingham A wealthy bedroom community. Hull - Located on narrow Nantasket Peninsula, a beach town. Kingston - Nearby to Plymouth with its own harbor. Marshfield - A coastal residential and beach town. Middleborough - The second largest town in Massachusetts with some colonial history. Plymouth - Famous for its Pilgrim history and Plimoth Plantation. Plympton - A small, rural town. Randolph - A city on the I-95 beltway. Rockland - Chain hotels available in this town. Scituate - A coastal town. 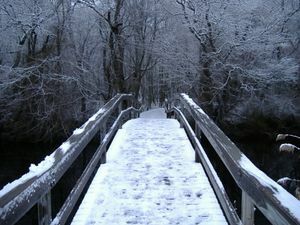 Footbridge in Marshfield Audubon Society. The South Shore region is largely a collection Boston suburban bedroom towns that share in Massachusetts colonial history. Most of the cities and towns were settled in the early 17th century and have historic buildings of that period. Boston's Logan International Airport (BOS) is the closest to this area and has the most flights. Some travelers might use T.F. Green Airport (PVD) in Warwick, RI to avoid traffic congestion or get lower fares. MBTA,  commuter rail services the region through three lines. The Kingston/Plymouth Line stops in: Braintree, South Weymouth, Abington, Whitman, Hanson, Halifax, Kingston and Plymouth. The Middleborough/Lakeville Line stops in: Braintree, Brockton (3 stops), Bridgewater, and Middleborough. Massachusetts Route 3, the Pilgrim Highway, is a major highway serving the South Shore. Route 24 borders the west side of the region and is a major artery. Both 3 and 24 are accessible from Interstate 95, which borders the region to the north. Plymouth & Brockton Street Railway Co, 8 Industrial Park Rd., Plymouth, Phone: +1 508-746-0378, . MBTA ferries run between Boston and Quincy, Hingham and Hull. There is ferry service from Provincetown to Plymouth. Massachusetts Bay Transportation Authority (MBTA), . Serves the area with commuter rail lines between South Shore towns and Boston. Plymouth/Kingston Line, . With stations at South Weymouth, Abington, Whitman, Hanson, Kingston and Plymouth. Middleborough/Lakeville Line, . With stations at Braintree, Holbrook/Randolph, Brockton (3), Bridgewater and Middleborough/Lakeville. Plimoth Plantation, the Mayflower II and Plymouth Harbor in Plymouth. Pilgrim Hall Museum, gallery museum of Plymouth history and the Pilgrims in Plymouth. World's End, part of Boston Harbor Islands in Hingham. A show at South Shore Music Circus in Cohasset. See a play or show at Company Theatre in Norwell. Cranberry harvesting in Carver in September and October. Go to the beach in Hull, Marshfield, Duxbury or Plymouth. Go fishing or on a whale watch in Plymouth. Race a Formula One replica at F1 in Braintree. Seafood is a focus in these coastal towns and proximity to Boston permits a range of fresh ingredients to be used. Mostly likely you will always be no further than 15 miles from a well-trained top notch chef's restaurant. Boston, Cape Cod and the North Shore are only an hour away. This page was last edited on 1 May 2015, at 20:38.